Video of Andy Lewis using old towels for tree protection. Nothing complicated here – just get some old towels, piece of carpet or foam (the thicker the better) and protect the tree with it. The acquisition price is the biggest advantage of this method as you can get most of the protection materials for a very low price or even for free. 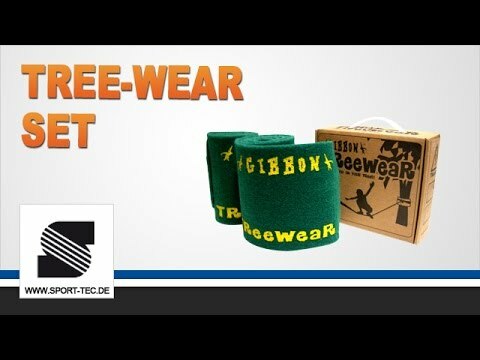 Contrary to carpet, towels and other materials, Gibbon Treewear is designed specifically for tree protection and therefore offers much more comfortable setup. It is made of non-slip felt and uses a velcro – so you just attach it to both trees and then set up the line (instead of preparing the slackline and then inserting tree protection under). However, the biggest disadvantage of this tool is its limited size. It comes with two 100×14.5 centimeter pads (39×5.7 inches), which is not enough for larger trees. So Gibbon released also a larger XL version. Use only strong, healthy trees with diameter of at least 12 inches. Trees with thick and rough bark (oak, birch, pine) are much better, don't use beeches for example as their bark is thin and very difficult to protect. Don't forget that even if there is no visible damage on the bark, you may harm the tree's vascular system underneath it. Have the line set up only when you actually use it, don't leave it up for more than a few hours without walking on it for example. That not only protects the vascular system of the tree underneath the bark, but also helps to preserve your slackline's condition. So don't be lazy, with most setup systems it's quick and easy to do.